Views of Venezuelan Protests Part I: Where are the Poor Protestors? Images of burning tires, masked youth, and clashes between citizens and state security forces have accompanied almost all news coverage of Venezuela for the past few weeks. And these well-documented protests and the government response to them have, as blogger Francisco Toro wrote, changed the political game in Venezuela for the foreseeable future. To fully appreciate these changes, however, we need to also appreciate the geographical limits of the opposition protests. Taking into account where protests are not occurring, and why, is important in understanding what they represent for residents who do not live in the zones where protests have erupted. These protests have not engulfed the entire country or even the entire capital, despite coverage and photographs that might suggest otherwise. Recent articles in Ultimas Noticias have declared the western side of the city, which normally grabs headlines for its high homicide rates, as tranquil and quiet in comparison to the east. I live and conduct research in Catia, a massive grouping of working and lower-class barrios in the western section of the city that have long been considered a Chavista stronghold. Though I had heard about the violence that erupted on Youth Day, when clashes first came to a head in Caracas, I had to go into the city center to find evidence of protests: A grouping of National Guard and National Police officers blocking the Avenue Francisco de Miranda in Chacaito, looking bored and tired by 8 o’clock at night. The next day I walked down to the National Security University’s location here in Catia, where zooming motorizados (motorcycle taxis) on the main avenue were, as usual, the gravest danger that I encountered. This does not mean that the Catienses (residents of Catia) I know are unaware or completely unaffected by what is going on in the east. When visiting various friends’ homes, the television in the background is almost always set to pro-government channels like VTV or Telesur, with images of the protests occasionally soliciting commentary. But this commentary tends to be relegated to references to the crazy opposition echando vaina (politely put, “causing a ruckus”) in their own streets, destroying their own property as they vent frustrations over multiple electoral losses. While watching the news after Leopoldo López turned himself in, one friend compared him to a child throwing a temper tantrum when he did not get what he wanted when he wanted it. Nor do I mean to suggest that tensions are not high and Chavistas are not disillusioned. The day before Youth Day, I stood with a friend in line for almost two hours to buy toilet paper, coffee, and arepa flour. We took advantage of the time in line to strike a deal with the woman in front of us due to the cap on a number of certain products that one family can buy. We bought two extra bottles of oil in exchange for her purchasing arepa flour for us. By the time that we made it to the cashier a fight almost broke out behind us when a man accused another man of breaking in line. My friend’s comment from earlier that day—that Venezuela was reaching a breaking point with tensions ready to erupt—echoed in my head as we walked out of the store. Families are strained by food shortages; they are upset with the PSUV; and they are tired of inflation. This same friend who made the comment about López was an active member in multiple Chavista organizations up until this year, when he stopped participating completely. He now says the worsening economic situation in the country and corruption in the PSUV has produced a desire to “detoxify” himself of all things political. But for people I know on this side of town, these protests have little to do with resolving their problems, and many believe that they will only make things worse. They also fit into a widely accepted perception by Chavistas that the opposition is willing to go to any extreme—hoarding food, destroying infrastructure, etc.—to regain the power they lost under Chávez. With the 2002-attempted coup and the oil strike of 2003 in the background, Chavistas see the current guarimbas (which refers to urban violence organized by the opposition) as one more historical moment that “el pueblo puede aguantar” (the people can endure). Indeed, for Chavistas these guarimbas are about a power struggle, not political rights or economic hardship. None of this is to say that protesters do not have legitimate grievances that the government has ignored. But, as has been mentioned previously, these grievances are not ones that tend to generate support or ire in popular sectors here. And the way in which protesters have gone about expressing these grievances in the past few weeks have only worked to further entrench divisions between east and west. Thus, it is highly unlikely that current tactics will win over the disillusioned Chávez supporters that Henrique Capriles was able to sway last year. 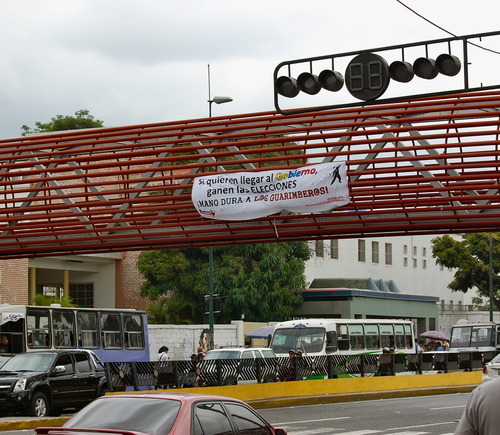 While walking home yesterday, I noticed the banner above that had been draped across a walkover bridge on Sucre Avenue. It reads: “Si quieren llegar al gobierno ganen las elecciones! Mano dura a los guarimberas” (If you want to get to the government win elections! Get tough on organizers of violence!). As Capriles himself pointed out in a recent speech, few people outside of the middle and upper class sectors in the east are going to be won over by the protests in the east. For many these tactics have solidified the belief that the opposition has no qualms about breaking the democratic rules of the game. Thus, they are likely to generate support and justifications for more, not less, censorship of the opposition voice. Rebecca Hanson is a graduate student in sociology at the University of Georgia doing doctoral research on police reform and citizen participation in Venezuela. She also writes for the Washington Office of Latin America blog. → Policing an Occupied Legislature, Part Three: Throwing Police Under the Bus.